Many of the top players throughout history all share a little secret - they solved chess problems. Not tactical puzzles or endgame studies (those are great too! ), but specially constructed chess positions with an immediate task: checkmate in two moves, checkmate in three moves, checkmate in four or more moves. These practical tournament chess players knew that one of the best ways to improve their game was to solve problems, a secret key to success which has been passed down to the elite masters of today. Can you guess what these notable players have in common? Andre Philidor, Wilhelm Steinitz, Adolf Anderssen, Johannes Zukertort, Sam Loyd, Oldrich Duras, Richard Reti, Paul Keres, Karel Traxler, Yuri Averbakh, Vasily Smyslov, Pal Benko, Susan Polgar, and John Nunn...to name just a few. That's right, they all solved chess problems regularly. And here's another fun fact: each year there is a World Chess Solving Championship, in which "solving Grandmasters" compete under strict conditions. Simply put, the exercise of solving chess problems is well known to improve overall board vision, increase tactical ability, enhance critical thinking, and to focus the concentration. The first benefit to the solver is in seeing hundreds of mating nets, checkmate patterns that replicate themselves time and again in actual tournament play. How many times have we overlooked a "simple" checkmate in our own games? Francis Percival Wenman was the champion of Scotland in 1920, and a prolific author of popular chess books. As a composer of problems himself, Wenman had a good eye for beauty in the already beautiful world of chess problems. Here we have 30 problems of the "Mate in Three" variety, and 50 "Mate in Two" problems - with all key variations computer checked, so that the reader sees hundreds of mate patterns against various defenses and sidelines. One example is enough to demonstrate the worth of knowing these mating nets. 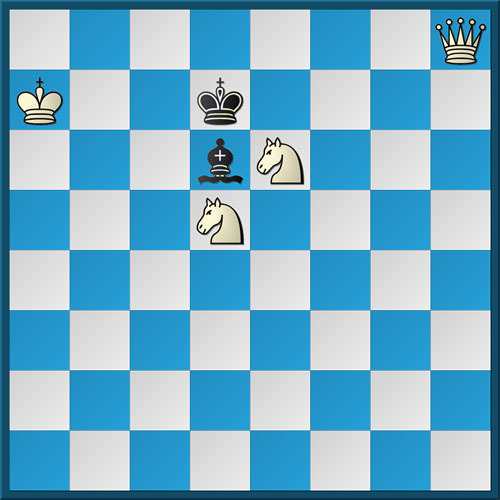 Below is a two-mover with no variations at all, a straight line to checkmate. That's the only hint offered, and no fair using Fritz!